The idea to establish an educational theater to introduce peculiarities in the Finnish culture to asylum seekers and refugees emerged in January 2016. The following month the team decided to launch a project called finstART, promoting cultural encounters and integration. Charter signing and the founding meeting of the association was held in April and the association adopted a name ‘Kickstart for Refugees ry*. First public presentation of the association’s project was at Lapinlahden lähde in May 2016. However, around the same time changes were taking place in the Finnish migration and asylum policies. No doubt, the 2015 refugee “crisis” was an unusual situation that led policymakers to re-think immigration policies on regional and national levels. The asylum regulations were restricted by removing humanitarian protection as a basis for asylum, conflict-ridden countries, such as Iraq and Afghanistan, were declared safe to return to, family unification was made nearly impossible, while also the appeal times got shortened and legal assistance was denied during asylum interviews. As a result, the number of residence permits issued to Iraqis dropped from about 80% to less than 20%. Due to these changes that threatened the legal protection and human rights of asylum seekers, the only possible choice was to freeze the current theater project focusing on integration matters, because the team felt all resources had to be directed to preventing human rights violations due to the new policies. In September 2016, the team started to work under the name “Right To Live | Oikeus elää” and set new objectives; The team formed a legality team to monitor the actions of authorities and courts, a lobbying team to persuade politicians and authorities to respect the international agreements ratified by Finland. Also an advocacy team was formed to increase public awareness by advocating refugee rights, countering xenophobic prejudice, organizing pro-human rights demonstrations and urging the press to report on these issues. Due to the expanding scope of activities the association has taken on, it decided to change its name in November 2017 to better reflect its people and mission. 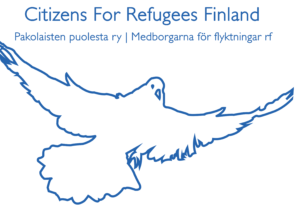 The new name of the association is thus ‘Citizens for Refugees Finland’ and it works on its mission to monitor, advocate and unite, and urges the people in FInland to join in to underwrite history for Finland that we can be proud of in the future.